I have been reading BAGnewsNotes.com since probably its inception. The visual analysis of news photographs is a fascinating aspect of the media war we are currently in. For you newsblog fans who dont regularly go to BAGnewsNotes.com I strongly reccommend you do. 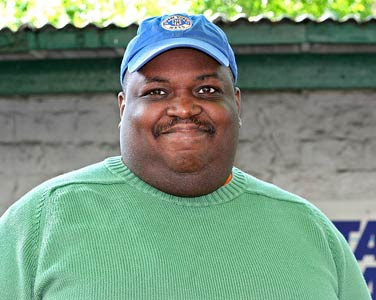 Michael Shaw the proprietor over there has provided us with an original post, enjoy. -- Hubris Sonic update: i screwed up the order, now they are right. gomen nasai. For a couple years now (I'm sorry to say), I've been tracking images of U.S. soldiers conducting searches and raids in Iraq. What bothers me most about these scenes (here's one from October 17, 2005) is how they violate the Iraqi's domestic space. I've taken heat for focusing on these types of images. "It's a war, don't you know!" "Where do you thing 'they' stash their weapons??" The thing is, if I felt that these raids were effective, or if I had seen how this cat-and-mouse business cumulatively added up to something over the years, I would have backed off. That said, I hadn't done a "raid" search for a while. What "inspired" me last week, however, was just one more shot of our guys busting through gates, going up what appears like the same staircase, and putting heat on the same Iraqi women left to deal. ... See the NYT slideshow here (with article). On my latest "raid tour," I turned up the two images above. If the whole Iraqi debacle wasn't so sick, I would push harder on the analogy of "the game." Still, to the extent that war -- especially an asymmetrical one -- is a match of wits, the metaphor doesn't seem off base. 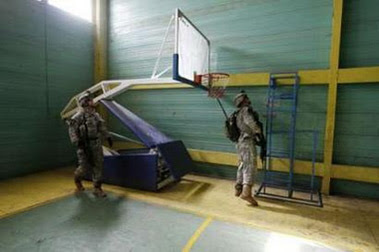 In the first shot, the fact that U.S. soldiers are poking around a basketball court (which actually is America's game, right?) conveys to me the complete incongruity of us still being over there. 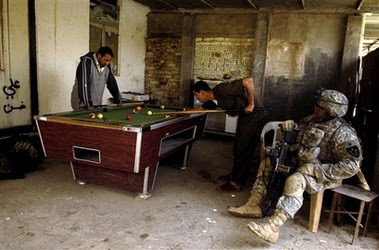 It's the second shot, however -- with the pool table -- that seems emblematic of our current military circumstances. These guys, the Iraqi's, with all the complexity of their factions, actions and inactions, hold down the table, while we, fully dressed for our own style of combat, sit off at the periphery, looking like aliens, because we really don't know the game.